In excellent structural condition. Sturdy and was on display with dolls, but not sat in regularly. I hope you will love to add this to your collection! See pictures. Nice Piece ! 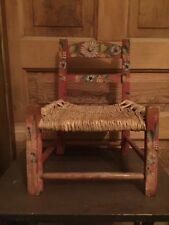 This is made of wood with a straw rush seat, it is hand painted. All pricing is up front so you know exactly how much everything is! A rare pair of circa 1960’s / 70’s Greek Klismos chairs. The fabric has been recently replaced. Condition consistent with age and use. The finest range, available online, direct from France. Because we are side-by-side with the best French suppliers, we refresh our range weekly.